The Data Breakthrough Advantage Program™ will help you extract insights from your digital analytics data to accelerate growth in reputation, relationships, leads or sales. The Data Breakthrough Advantage Program is for digital property/content managers, corporate marketers and online business managers who are interested in measurable results, building competitive advantage, and focused on growth. Assess the metrics you are currently collecting and advise if Key Performance Indicators are aligned or mis-aligned with your goals. Create a Measurement Plan or update one you have. Evaluate the quality of data your digital properties are capturing and identify any gaps that may be impeding quality. Assess dashboard and reporting alignment against the Measurement Plan. Recommend data-driven strategies that will accelerate measurable results and keep your organization focused on the metrics that matter most. Focusing on a specific content area or campaign type, we evaluate if the right digital analytics data is being collected and the right analytics processes are being used for effective campaign assessment, content usage analysis, brand awareness or digital customer satisfaction. We will recommend upgrades to data collection or analytical processes and strategies so that your future evaluations are timely, effective and actionable. Reports should not be an output or end product. Reports should support your optimization processes and guide you to your next action, whether that’s more analysis, collaborative discussions or specific actions. Using the Measurement Plan as a guide, we will help you create effective reports and visualizations. Customized by client, situation and opportunity, here are a two scenarios to help you visualize how Results Maximizer can help:You’ve completed usability studies or analyzed your content or advertising, email and search engine campaigns. You now have several new creative options that you want to test in advance of a full or site-wide rollout. We can help you design a valid and cost effective split or multivariate test to optimize your creative. We will monitor, analyze and report on test results, and recommend further investigations.You have a pay-per-click campaign that is not delivering the results you were expecting. You want more. We will audit your campaign and recommend action that you can take to turn performance around. And if you’d like to outsource campaign management, let’s talk. 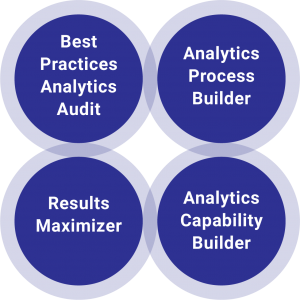 For analytics to deliver value, the requestors of insights need to ask useful questions and support a productive analytics process. Therefore, we recommend training not just analysts, business analysts and developers but also marketing, client services, product managers and directors. Upgrade your in-house data governance and analytics capabilities to drive your own data-driven breakthroughs. We provide training and on-going coaching, so that you and your teams learn hands-on with your own digital data. Not sure if you need one module or all four? Contact us and let’s talk about whether one module, four, or some entirely different solution, is best for you.